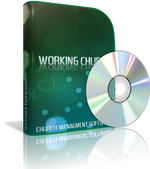 A free, fully-functional demo of Working Church, church management software is available for download or on CD. Click the image, or link, below for instant access. Click here to get your free demo of Working Church - church management software. Refund Policy. Our product is downloadable, fully-functional, free to use for up to 25 members, and try-before-you-buy. We provide our software free for your convenience to fully evaluate the product in your computing environment. If you purchase our product, after we receive payment notification that your purchase has been approved, an email will be sent to you with an activation key to unlock the software. Once this information is emailed to you, there will be no refunds given. We must enforce this policy since it would be impossible for you to return your registered version of our software.